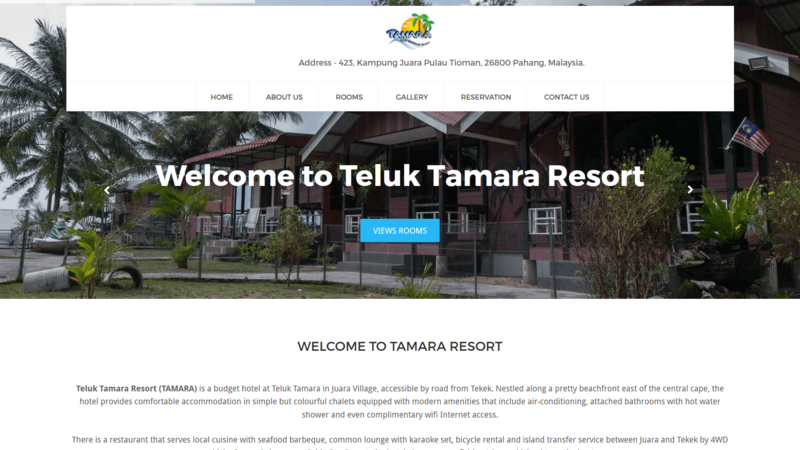 Teluk Tamara Resort (TAMARA) is a budget hotel at Teluk Tamara in Juara Village, accessible by road from Tekek. Nestled along a pretty beachfront east of the central cape, the hotel provides comfortable accommodation in simple but colourful chalets equipped with modern amenities that include air-conditioning, attached bathrooms with hot water shower and even complimentary wifi Internet access. There is a restaurant that serves local cuisine with seafood barbeque, common lounge with karaoke set, bicycle rental and island transfer service between Juara and Tekek by 4WD vehicle. Formerly known as Cabin Bay Resort, the hotel also arranges fishing trips and island tours by boat.